Uttar Pradesh Subordinate Service Selection Commission (UPSSSC) had successfully conducted written test for the posts of Ganna Supervisor (Ganna Paryavekshak) / cane supervisor on 03.07.2016. Earlier Uttar Pradesh Subordinate Service Selection Commission had completed the application process for this Advertisement No. 07-EXAM/2016. Now the result of UPSSSC Ganna Supervisor exam had been declared on 28 September 2016. Appeared candidates can check their UP Ganna Supervisor Exam Result from here after its declaration. 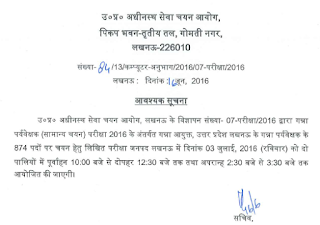 Uttar Pradesh Subordinate Service Selection Commission is going to conduct written exam for Ganna Supervisor / Paryavekshak posts on 03 July 2016 in two sessions i.e. from 10:00 to 12:30 pm and from 02:00 pm. For that, admit card are required to appear for the exam. Candidates have to download UPSSSC Admit card for Ganna Supervisor from upsssc.gov.in admit card page via below link. The test will be held at various centres / cities located in Uttar Pradesh. The admit card have details like roll no., reporting time, timings, test centre address etc. can be checked by downloading the hall tickets. Current Status: released on 27 June 2016. The written examination consists of objective type questions. There will be two papers. You can check the pattern from below. To get the admit card for UPSSSC Ganna Supervisor exam, candidates can visit this page. At that, you will see registration no., gender etc. boxes. You have to enter your registration no. and date of birth to get your admit card. 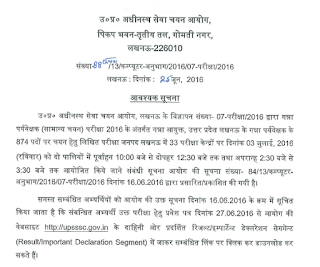 After entering those details, UP Ganna Supervisor Admit card 2016 will be showing. You have to take a print of it on a plain paper.